Vassar was the first women's college in the United States with a liberal arts curriculum that included ancient Greek. At the time of Vassar's founding, knowledge of the Classical languages, Latin and Ancient Greek, was a prerequisite for university studies for men and a central part of those studies. The admissions criteria and curricula of Harvard and Yale, after which Vassar modeled its own curriculum, required substantial study in both languages. Vassar modified its admissions requirements to acknowledge that young women may not have had an opportunity to learn Greek; but it incorporated Greek into its curriculum in the belief that what was good for Harvard and Yale students was good for Vassar women. Young women seeking admission to Vassar in its early years were required to pass entrance exams in Latin and a second language, which could be Greek. Sample admissions exams for Greek and Latin are included in the catalogue for 1880-1881. The Latin exam included selections from Caesar, Cicero, and Vergil for translation as well as the requirement that students compose an essay in Latin! After they arrived in Poughkeepsie, the earliest Vassar students continued their study of Classical languages as part of the "core curriculum" of the college. Beginning in the college's third year, all students chose between a "scientific course" and a "Classical course" of study—students electing the scientific course were required to study Latin for at least a year; those electing the Classical course studied both Latin and Greek throughout their time at the college. From 1890-1920 the new departments expanded their curriculum from philology to a broader vision of "Classical studies" including the study of history, theater, and particularly material culture. Coins, topography, and Greek vases were all added to the advanced curriculum, and a special certificate in Greek archaeology was added to the two majors in Greek and Latin. The catalogue of 1904-1905 proudly proclaims that the "Department is equipped with an electric lantern and has illustrated lectures in connection with the different courses." The years surrounding the depression and WWII saw continuing experimentation in the Greek and Latin curriculum. In 1927-28 a joint major in "Classics" (combining the Greek and Latin majors, which also were retained as separate majors) was introduced. It required study of both ancient languages in a single major, reflecting the beginnings of a unified field of classics encompassing both the ancient Greek and Roman worlds. In 1935-6 the classics major was dropped, presumably because the challenge of mastering both Greek and Latin was too great, and a new major in classical archaeology was added, which joined philological study of both languages with archaeological practice. In 1947 the two departments combined into a single Department of Classical Languages and Literatures, with students focusing in either Greek or Latin. It was also in the mid-30s that the department began to offer courses with readings translated into English for non-majors. This model of a single department where students focused either in Greek or in Latin, with curricular offerings in archaeology, history, and literature in translation for majors and non-majors, remained the departmental structure until 2000. But as early as 1943, the Greek Department was also involved in interdepartmental “special” majors. The description in the catalogue of 1943 of one of these majors, “Social and Economic Problems of Greek Civilization,” provides remarkable evidence of a consistent desire among faculty to tie the study of antiquity not only to concerns of the present but also to other disciplines’ methodologies. The stated objective of this major was “to enlarge and deepen the understanding of the economic, sociological, and anthropological processes of today by studying them in the more objective, relatively limited, but comparably complex civilizations of Greece; to develop a better understanding of ancient civilization by application of modern methods of economics, sociology, and anthropology.” The major was jointly administered by the departments of Greek, Economics, Sociology, and Anthropology. In 2000 the department added a third major in Ancient Societies, which required a year-and-a-half of one of the ancient languages and further study in archaeology, history, philosophy, art, religion and literature, offering multidisciplinary study that students could pursue without extensive knowledge of the languages. In 2010 the department changed its name to Greek and Roman Studies and created a curriculum which emphasized the intellectual community of all the students majoring in the department, whether their approach was philological, archaeological, historical, or literary and whether they focused on Greek or Roman culture. Throughout the years these changes illustrate the challenge of trying to encompass the study of the ancient Greek and Roman worlds in a coherent and manageable form for undergraduates. The challenge of learning an ancient language, as high schools offered less and less preparation, made the philological aspects of the major difficult for many students; at the same time, the enormous attraction of the richness of cultural, literary, archaeological, and historical material from the ancient world drew increasingly large numbers of students to the department, and the interests of the faculty expanded more extensively into multidisciplinary interests, including the study of other ancient cultures as well as the study of the reception of ancient ideas and works of art by later cultures. These changes in the curriculum over time were inspired by a remarkable group of classicists who have taught at Vassar over the years. There was a professor of Latin as well as other instructors in Greek and Latin on the faculty from the college's opening year. 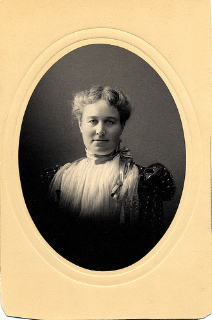 Early teachers of Greek and Latin included Abby Moore Goodwin, the first woman to teach in the department. The first woman to achieve the rank of Professor was Abby Leach, who came to the college as Teacher of the Greek and Latin Languages in 1883. 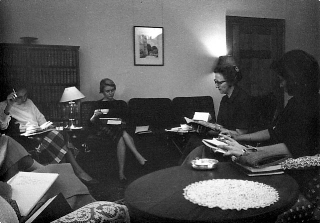 The early years of the department(s) are especially important for the history of classical scholarship because women’s colleges—Vassar, Smith, Bryn Mawr and Wellesley in particular--served as the major source of employment for talented women scholars of antiquity who had international reputations and who served on the administrative boards of the American Philological Association, the American Academy in Rome, and the American School of Classical Studies in Athens. ﻿Abigail Leach was the first woman to be accepted by Harvard professors as a student, although there was no Radcliffe at the time and certainly no female Harvard students. Because of her success studying Greek and Latin with Harvard professors, the “Annex” was founded, later to become Radcliffe. She taught at Vassar from 1883 until her death in 1918, and served as the first female president of the American Philological Association in 1900, one of four early female Vassar faculty members to do so. Since this chaotic and bellicose history of its early years, the department has been a model of cooperation and mutual support among faculty and students, with only occasional disruptions, caused by classicists’ characteristic tendency to be passionate about their field and method of study. ﻿Elizabeth Hazelton Haight was the second Vassar classics major (graduating in 1894) to return to the school as a faculty member, in 1902. She earned her MA from Vassar in 1899 and her PhD from Cornell in 1909. She taught only Latin, except for two courses in Greek, in her 44 years at Vassar. She began the Vassar Classical Museum and served as the 2nd female president of the American Philological Association from 1933-34. She wrote 11 books on a variety of classical subjects, both Greek and Roman (and three books on Matthew Vassar and his “Magnificent Enterprise”). Her last book was published when she was 82. Elizabeth Pierce was a student at Vassar, receiving her MA in Latin in 1912 and her PhD from Columbia in 1922. From 1915-1922 she taught ancient art at Vassar and was assistant curator for the Art Gallery. Of all the distinguished women classicists who were involved early on with the Vassar department, Elizabeth Pierce Blegen has had the most long-lasting effect on the department. Her will bequeathed an endowment to the department to support research in classical antiquity and has allowed the department to bring a research fellow or distinguished professor to the college every year to teach a course and do research. Although she only taught in the department for seven years, her life-long association with another Vassar classicist, ﻿Ida Thallon Hill, who taught in the department in 1901-3 and 1906-7 and then moved to the History Department until she left in 1924, kept her connection to Vassar strong. Both women spent most of their professional lives in Athens, at the American School of Classical Studies; each married archaeologists whom they met there: Carl Blegen and Bert Hodge Hill. The four of them shared a house in Athens and supported, in a variety of ways, each other’s work. This connection between Vassar and the American School of Classical Studies has remained strong, as has the importance of archaeology as part of a classics curriculum. ﻿Lily Ross Taylor, of all the women who taught Latin at Vassar, probably had the most distinguished career. She received her PhD from Bryn Mawr in 1912 and taught at Vassar from 1912 -1927, after which she returned to Bryn Mawr, where she remained for the rest of her career. She was a Latinist and in 1917 was named the first female Fellow of the American Academy at Rome; she served as the 3rd female president of the American Philological Association in 1942. Her interest in Roman cult and Roman politics, about which she wrote seminal works, was continued by her successor at Vassar, Inez Ryberg, who shared not only intellectual interests with Lily Ross Taylor but also a debt to the American Academy in Rome, which nurtured both of their scholarly careers. One of the prominent characteristics of the department is its long-lived connection to material culture and archaeology, nurtured by the scholarship of many faculty members thought its history. Vassar students have had unusual opportunities to understand the connections between material culture and literary and historical texts and have been encouraged to experience the physical remains of antiquity in Greece and Italy, as well as to learn archaeological techniques by participating in digs throughout the Mediterranean world. 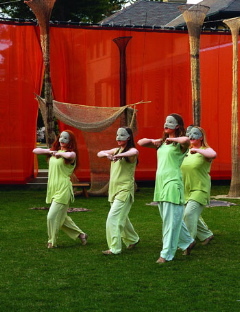 The department has also had a tradition of putting on theatrical performances of Greek tragedy. The earliest was a performance (in ancient Greek) of Antigone in 1893. The production, with an all-female cast, cost $4,000—nearly ten times the cost of tuition at the time. 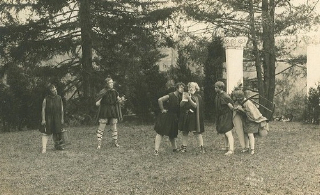 In 1931 Hallie Flanagan, the founder of the Drama Department, directed a performance of Hippolytos in Greek, in which Philip Davis, a member of the Classics Department, performed. In 1934 Hallie Flanagan and Philip Davis were married, while he was on sabbatical in Greece. More recently, in 1999, this tradition (of performance, not of the marriage between participants in the performance!) was revived when three Greek majors chose to do a joint production of Euripides' Bacchae in the original language as their thesis work. The cast of men and women were all fellow students. In 2007 Professor Rachel Kitzinger directed Oedipus at Colonus, this time in English, using her own and professor of English Eamon Grennan’s translation of the play. As with Flanagan’s Hippolytos, the production was a joint effort between the Classics and Drama departments. 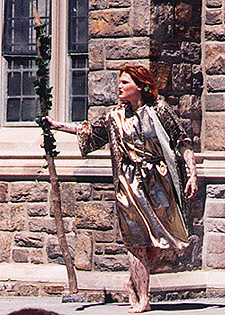 A professor of drama played Oedipus; other parts were taken by drama or classics students. The music was composed by a Vassar alumnus; the set designed by a Vassar alumna; and the choreography was created by a classics and dance student as her senior thesis. In recent years the faculty has expanded the multidisciplinary interests displayed by early members of the department into teaching in a number of multidisciplinary programs: Jewish Studies, Media Studies, Women’s Studies, and the College Course program. Courses in the department have explored in explicit ways the influence of ancient cultures on contemporary culture and the ways modern points of view provide an interesting lens through which to view antiquity.